Serving delicious American cuisine at affordable prices, or join us for lunch at our second location, Plates Midtown, and enjoy a locally sourced, build-your-own-bowl featuring your choice of greens and freshly roasted vegetables, plus chicken, steak, tofu, short rib, salmon or ahi tuna and a variety of finishing sauces. A part of Saint John’s Program for Real Change, Plates Café is a social enterprise which supports the employment training of Saint John’s clients - 100% of the proceeds from Plates Café directly supports women working to recuperate and re-engineer their lives. Saint John’s Program for Real Change breaks the cycle of poverty, violence and dependence one family at a time by unleashing the potential of mothers in crisis to improve their quality of life and achieve self-sustainability. Our 12-18 month comprehensive program includes mental health therapy, alcohol and drug counseling, parenting education, budgeting classes, healthy relationship training and a proprietary Employment Training Program. Accommodating over 500 clients and their children each year, 96% of Saint John’s Employment Training Program graduates secure unsubsidized employment, a crucial step in their journey to self-sustainability. 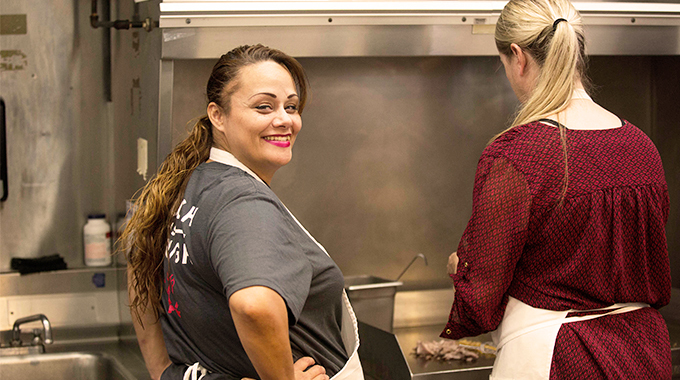 When you dine with us or let us cater your next event, your funds directly help provide job training and supportive services to women in need. So let us fill your appetite for delicious food and Real Change in our community.